As with many design processes, the French Smock began as a collection of images and thoughts that eventually made their way into a tangible piece of clothing. The idea landscape included impressions of artists and painters, sun-dappled windows and long afternoons, French cafes and pastoral Europe, and aprons that long to turn into everyday wear. The top that emerged from these ideas is a piece that easily pairs with other clothing to provide a little extra warmth when needed, but is also an easy way to turn a t-shirt and jeans or a skirt into something a little special. The construction of the French Smock is quite simple: the main body is knit flat, and then straps are knit separately and attached to cross in the back. A smaller needle size adds density to the upper band of the top and straps, and a ribbon sewn on the inside of the straps also prevents stretching. 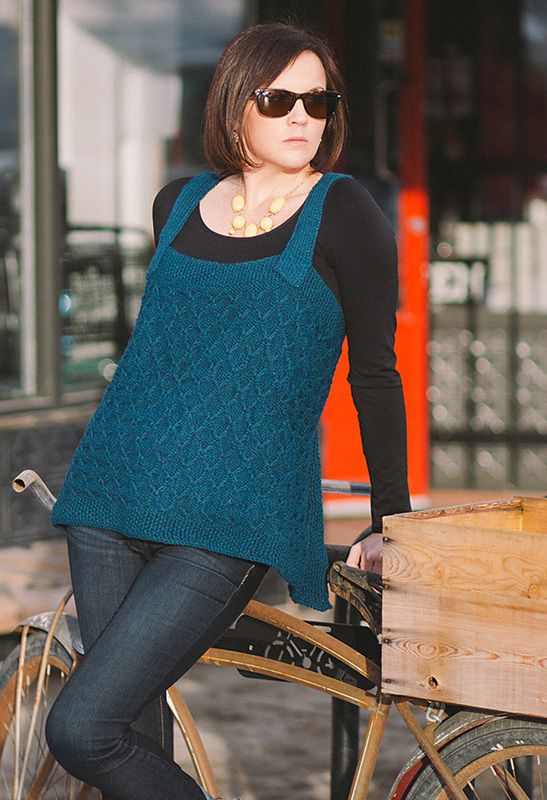 Seed stitch at the edges of the top prevents rolling, while the pattern repeat over the main knit area creates an eye-catching design that is highlighted nicely by Cascade 220. 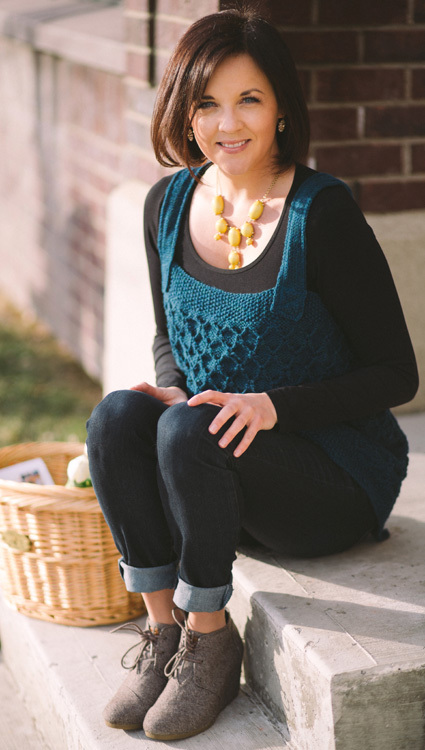 I chose Cascade 220 for this project because it makes the French Smock a piece that is both affordable and quick to knit up, and it also adds structure and durability to the finished piece. shown in size L, to be worn with a 2-4" overlap at the centre back. Body of smock is worked flat. Straps are knit separately and then attached. The straps are lined with ribbon to prevent stretching. All Rows: [K1, p1] to last stitch, k1. 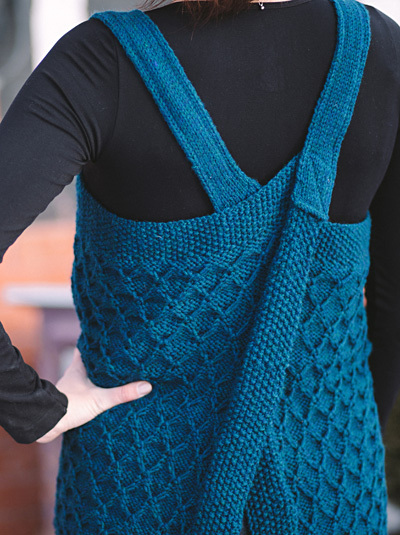 For easy, intuitive knitting: Seed St alternates the stitches on each row, so you always work the opposite of what the stitch appears as, knitting purl stitches and purling knit stitches). Sl3pw: With yarn in front, slip 3 stitches purlwise. P1 over slipped sts: Insert right needle into next stitch on left needle (do not purl), then insert right needle under the strands of the slipped stitches. Purl all together. With smaller needles CO 123[141, 159, 177, 195, 213, 231] sts. Work in Seed St for 18 rows (work measures approximately 3 inches). Row 1 (RS): Work 9 sts in Seed St, p to last 9 sts, work 9 sts in Seed St.
Row 2 (WS): Work 9 sts in Seed St, k to last 9 sts, work 9 sts in Seed St.
Row 3: Work 9 sts in Seed St, (p3, sl3pw) to last 12 sts, p3, work 9 sts in Seed St.
Row 9: Work 9 sts in Seed St, (p4, p1 over slipped sts [see notes], p1) to last 12 sts, p3, work 9 sts in Seed St.
Row 11: Work 9 sts in Seed St, (sl3pw, p3) to last 12 sts, sl3pw, work 9 sts in Seed St.
Row 13: Rep Row 11. Row 17: Work 9 sts in Seed St, (p1, p1 over slipped sts [see notes], p4) to last 12 sts, p1, p1 over slipped sts, p1, work 9 sts in Seed St.
Rep Rows 3 to 18 until work measures 13[13, 16, 16, 19, 19, 22] inches, ending after Row 18. Work 16 rows in Seed St.
Work in stockinette until strap reaches 18[18, 20, 20, 23, 23, 26] inches or until length desired for over shoulders. Bind off and secure loose ends. Machine or hand-sew contrasting pieces of ribbon lengthwise on the wrong side of the strap to prevent stretching and curling. Either use two strips of skinny ribbon at either edge of the strap or one wider piece in the centre. Straps are attached at the front and edge of the smock. 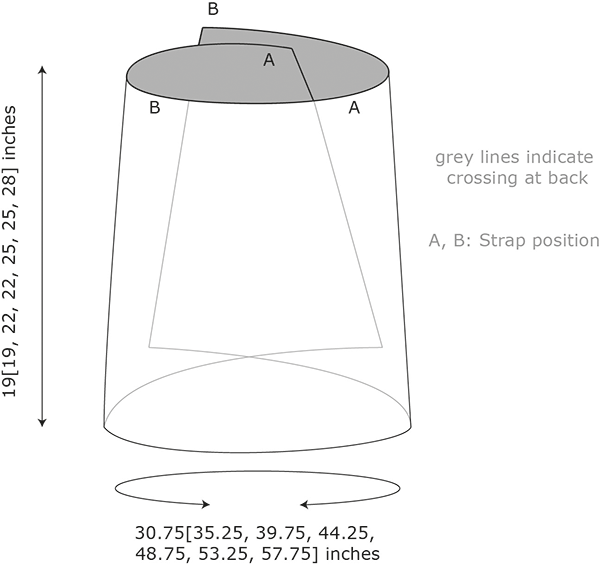 Sew straps so that one end rests at each shoulder in the front, and the other end crosses at the back to attach to the opposite corner edge of the smock -- indicated letters A and B on schematic. For Joleen, a.k.a. Kraftling, knitting and crocheting evolved from a hobby to an all-consuming passion (some would say obsession). 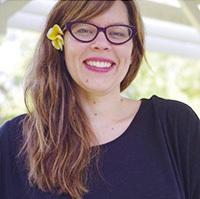 Inspiration for her designs is drawn from past travels, current trends, and all kinds of things in between.